It’s impossible to do justice today to Rachel Carson’s impact. I was in government at the time, and I remember all over Washington, people were talking about this book. The US federal government responded quickly to Silent Spring. Disturbed by the excerpts of Silent Spring in the New Yorker, President John F. Kennedy asked the Life Sciences Panel of the President’s Science Advisory Committee (PSAC) to investigate her claims. At a press conference on 29 August 1962, a reporter noted public concern about the use of pesticides and asked Kennedy whether he had directed “the Department of Agriculture or the Public Health Service to take a closer look at this.” He responded, “Yes, I—and I know that they already are—I think particularly, of course, since Miss Carson’s book but they are examining the matter.” On 15 May 1963, the PSAC released its report with the President’s clear approval. Rachel Carson and the press regarded it as a vindication of the book. The report did much to silence industry and agricultural critics and buttress the book’s scientific credibility. Foreign reviews of translations often mentioned that the Kennedy panel had substantiated Silent Spring’s claims. Secretary of the Interior Stewart L. Udall was an immediate convert. He invited Carson to attend one of the “Kennedy Seminars” at the Virginia home of Attorney General Robert F. Kennedy, the President’s brother, where a small influential group had the opportunity to hear her. In both the Kennedy and Johnson Administrations Udall became the leading governmental advocate for pesticide regulation. His published his own book on environmental problems, The Quiet Crisis, in 1963, in the wake of Silent Spring. 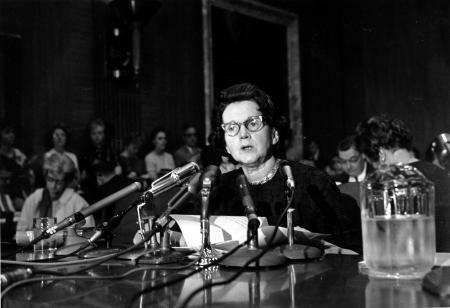 Rachel Carson testifying before the Senate Government Operations subcommittee studying pesticide spraying (June 4, 1963). Used with permission © 1963 ddp images. After Silent Spring, Congress revised the regulation of chemicals. Prior to 1962, the government regulated pesticides mainly to ensure that chemical preparations were effective and not fraudulent. The Insecticide Act of 1910 and the Federal Insecticide, Fungicide, and Rodenticide Act of 1947 (FIFRA) served these goals. A 1952 amendment to the Food, Drug, and Cosmetic Act established a procedure for setting tolerances for chemical residues in food, feed, and fiber, but not for regulation of chemical use itself. Now Congress amended FIFRA to include attention to safety considerations in pesticide labeling. Repeated environmental crises during the 1960s, including major events like the Santa Barbara, California, oil well blowout and the Cuyahoga River fire in Cleveland, Ohio, kept environmental issues in the headlines. The astonishing success of the first Earth Day in April of 1970 put tremendous pressure on politicians to act. The Nixon Administration established the Environmental Protection Agency (EPA) in 1970 and gave it authority to set tolerances for chemical residues. Congress amended FIFRA in 1972 to transfer pesticide regulation to the EPA and mandated protection of public and environment health. The EPA ceased licensing DDT in 1972. The Toxic Substances Control Act of 1976 was Silent Spring’s greatest legal vindication. It directed the EPA to protect the public from “unreasonable risk of injury to health or the environment.” Under its authority, the EPA acted to ban or severely restrict all six compounds indicted in Silent Spring—DDT, chlordane, heptachlor, dieldrin, aldrin, and endrin—and assumed responsibility for testing new chemicals.